Congrats on the Teen Vogue award! Love the dress!! No way, I get to be the first commenter. Hello! Again you stun me into fandom, Roz. GREAT photos, they truly look like fashion editorials to me, and to think you do it with vintage shopping and your family's whatnots. Amazing. Gorgeous. That blue is out of this world in the best possible way. You've styled it perfectly. Congrats on your TeenVogue feature. Won't be long when the feature is Vogue. Just sayin'. such a lovelily coloured dress! i love love your hat as well. well done on your Teen Vogue feature. love from amelia of La Ville Inconnue. What a darling dress. The color is magnificently striking! Oh my gosh I love this dress! The colour is beautiful and it's such a lovely shape. Beautiful as ever! These pictures are beautiful, blue suits you perfectly, and I love your hat! congrats on the teen vogue honor! i've said it many times, but....blue is your color! i believe any shade looks divine on you. I'm so happy to be finished with exams now! I love your outfit and the photography in this post. Also congratulations on your feature on teenvogue.com!!! Please feel free to stop by and comment on my blog!! The blue dress looks amazing. I love Beyond Retro. Congrats on TeenVogue, you totally deserve it!! I absolutely love this dress, the style, colour and length is my favourite vintage dress style, I had quite a few, but none is such a gorg colour! I also love the brown belt, I wear one with everything! wow this is another amazing shoot!! the blue is sooo vibrate and paired with your shoes and hat it's such a gorgeous combination! Congrats on your feature, you are lovely in this vibrant blue! Congratulations on the teen vogue feature, well deserved! I LOVE that blue! I am trying to find something in that blue, with bits of bright yellow and some green with it. thanks, such a pleasure for my eyes! i love everything about this post. you look gorgeous, and make me wish i had long, long hair. it's so neat your family helps out with your photos, and that you're pursuing your creativity! i have sewn a few things from vintage patterns, and i've found that the directions may seem rather confusing! a sewing teacher could always help you though! These are beautiful pictures and an amazing outfit! You are so right, this shade of blue is absolutely gorgeous. And the way you paired it with those creamy shoes and hat- just lovely. I love that picture of you leaning up against the log. And congrats on being featured on the TeenVogue blog! I love the electric blue!It's the new black! I saw the feature - you looked absolutely great! I love the look! the dress fits amazingly with the belt and the hat! Love the blue of that dress, and it really suits you. Just wondering if you got my email about a feature I want to write? I can't even handle how gorgeous you are in this shoot! The outfit, the scenery, it's all perfect! Being a blue lover I'm immediately biased, of course! Your ability to make this look like an outfit, rather than a costume, is unique. I could actually see you wearing this around town and not think it out of place at all! I think it's sweet that your family is involved with your photo shoot endeavours. The shoot you did with your mum was fantastic, she's such a gorgeous woman! Extremely photogenic, just like her daughter :). I'm always inspired by your posts to be involved more in art related stuff rather than being sucked in by hours of television. I love this blue! So beautiful! You have been given an award!!! you look like you're straight out of the 70's. so beautiful! congrats on teen vogue. Wow, I've seen you on teenvogue.com and i'm so amazed! You really look like a model! I like your style too! You deserve the spotlight at Teen Vogue! I wish more teens were as proactive and earnest as you in their ambitions. Can't wait to see the photoshoot with your parents. I featured you on my blog today as a blogger who inspires me! 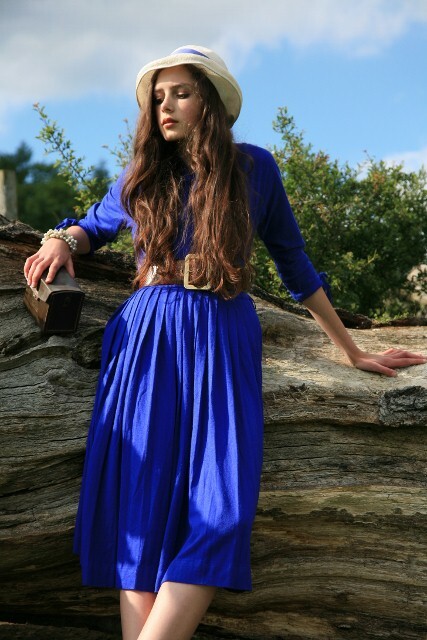 i really love this blue vintage dress and of course the hat. Hey! Found the link to your blog on Teen Vogue...and I love it! Especially the close-up of you with the vintage Kodak case. By the way, what kind of camera do you have? this is a wonderful blog for picking up tips on sewing, if you haven't already seen it... also she sews from vintage patterns, so it's really interesting! Love the dress and shots, even - and especially - because while I love blue, that blue isn't a colour I can wear well. Apart from a Calvin Klein knitted cardigan and skirt 'suit' with white buttons from the early 90s.. I really must wear it, at least the long cardigan, as a dress. Actually when I see you next I'll bring it and we can do a shoot in it! I just love the vibrancy of the blue dress! Also, well done on the Teen Vogue recognition, you must be so elated. i like looking at pictures of fashion & drawing and designing clothes (i have some pics on my blog of my fashion drawings), so im not saying that i don't like it. how did you get interested in vintage & fashion? thanks for the comment! & i love your blog! 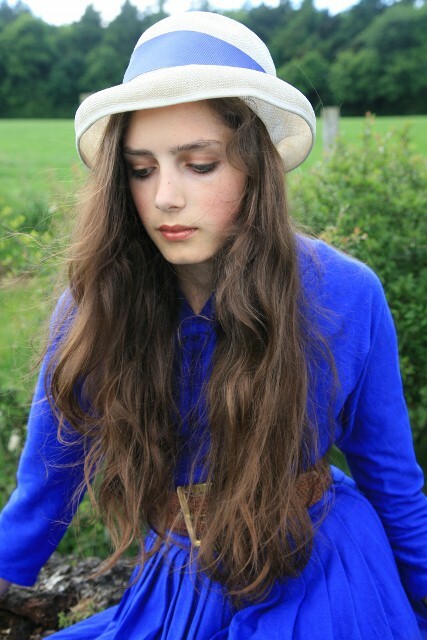 Very well done Roz, for your teenvogue snapshot win! You look fabulous. The eletric blue dress matches perfectly with your skin tone and hair colour and I love the matching ribbon on your hat. 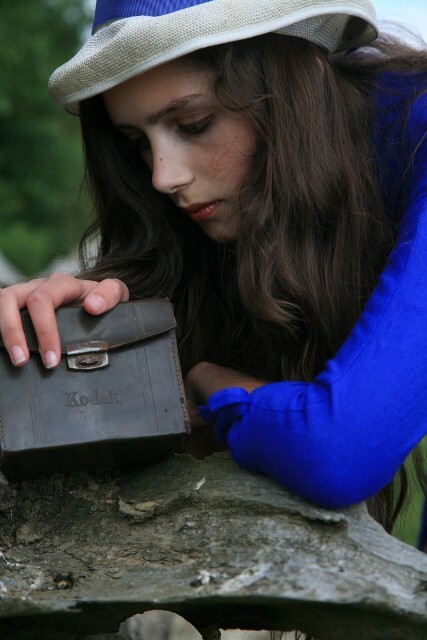 Lovely vintage kodak camera box and, oh my gosh, your nails are immaculate! Very envious as I bite my nails to nothing! Ah, I am having Beyond Retro withdrawal symptoms. Need to get up there asap. Also, I am very haphazard when making clothes and it takes at least two tries to achieve a semi-wearable garmet. I am in serious need of help! It is things such as how to correctly seam and do waistbands that I would like to know. I am just running stick woman! Also, thank you for your lovely comment, and I'm glad you are enjoying my posts! It is lovely to hear. i looooove this! the blue is so striking! lovely pictures.. that color looks amazing on you!